​Teardrop Banners are a fantastic way to promote your business for a very low cost. Here are some tips on how to set up your Teardrop Banner and how to care for the fabric banner. Setting up your Teardrop Banner will only take a few minutes. First you unpack the carry bag and assemble the flagpole by joining the seperate pole pieces together from largest to smallest. Simply insert one end of the poles into the other and push them together. Now the pole has been assembled it is time to attach the teardrop banner. Start by inserting the top of the pole (the smallest section) into the bottom rod pocket of the banner and push the pole all the way through the rod pocket until it reaches the very end. The end of the rod pocket has a reinforced section - and it is important that the tip of the pole remains in this reinforced section. If you allow it to come out of this reinforced section it can damage your banner. You now pull the banner all the way down the pole (while pushing the pole into the banner) and will notice that the top of the pole will start to bend. Keep pushing the pole and pulling the banner until the pole has bent into the full “teardrop” shape and the banner can go no further. Use the special locking strap provided to tie the bottom of the banner to the black securing hook on the pole. Tighten the strap. Once your flag base has been placed in it’s correct position, you can now insert the bottom of the pole into the spindle on the base. Your Teardrop Banner is now set up and ready to use. 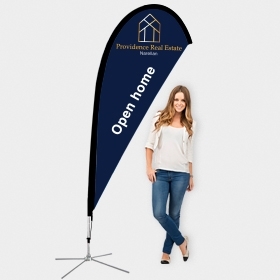 Your Teardrop Banner will arrive folded into a neat package and may arrive with some creases. These creases should come out naturally over time when used outdoors. However if you would like to quickly remove the creases the most effective method is with a steamer. A warm iron can also be used providing an ironing cloth is used between the banner and the iron. If your Teardrop Banner gets dirty you can clean it using cold water and a damp cloth. You can also wash it in a washing machine using a cold wash on a gentle cycle without any detergents or bleach. These Teardrop Banners come with strong reinforced fibreglass poles, heavy duty bases with fully enclosed ball bearing spindles - and an amazingly low price!